Some people cling to elements of their faith as if any threat to it would serve as a death blow to their eternal lives. Like proverbial sand in their hands, they hold it so tight that their grip presses the precious granules through their fingers, and they watch their shifting cargo slip grain-by-grain through their grasp until they finally consider there is not enough to hold, and they let go completely. They are left to wonder how quickly it was lost when they had held on so tight. A cute animated video series that pokes fun at major Hollywood movies once did a satire of the Blair Witch Project. A famous line from that video is often repeated by my children. In a desire to seek safety, one character implores“Quick, back to the tent!” Another responds sarcastically “Yea, the tent is safe. Nothing can penetrate the NYLON!” My boys always follow such quotes with hearty laughter, unaware of the profound realities exemplified in this humorous poke at a famous horror film. Like those who cling to the sand of faith in their hands, some of us put too much trust in the nylon fabric of some simple element of our faith. We trust in a child like perspective that is thin yet unsustainable under any real threat, seeking the sense of security it once represented for us, unaware that it provides no real protection but only hides from us from what scares us outside. For the past 15 years I have worked with countless people who, for one reason or another, have struggled with their faith. Some had already left in their hearts, but reached out in a desperate last attempt to regain what had already been released – like the sand that had already slipped through their fingers. Others reach out in response to someone they love who has abandoned what they had once “known”, looking for help to bolster the faith that remained, and give them answer to the criticisms that threaten them. Those who struggle are often in the throes of spiritual agony, looking desperately for the safety of the “tent” that had served as a sense of security in the past. In contrast, some people manage the nuances and twists and turns of critical information seemingly without the emotional and spiritual knots that become the undoing others. These seem able to navigate these challenges without the compulsion to cling to elements that slip through their fingers, or to seek safety behind a fabric of perception that brings no real safety at all. These are comfortable with the shifting sands of changing perspectives, and are comfortable knowing that, while the tent may represent security, the only real path to safety is not in returning, but in pressing forward. Faith is a word that by definition includes uncertainty. Alma states plainly that “faith is not to have a perfect knowledge of things; therefore if ye have faith ye hope for things which are not seen, which are true.” (Alma 32:21). By this we learn that faith demands that we not have proof or evidence demonstrated by our natural senses, but that we persist towards that which cannot be demonstrated by the natural man. In the Lectures on Faith, we read “that faith is the assurance which men have of the existence of things which they have not seen—that is, with their natural eyes—and the principle of action in all intelligent beings.” (Lectures on Faith 1:9). Faith is the power that drives us forward to what is true despite our lack of assurance so often sought by what nature has endowed us withas our senses. In a similar vein, the exercise of faith, like a muscle, occurs when there is opposition to it. The muscle that is strengthened is the one that persists to perform despite the weight that works against it. This muscle of faith therefore demands that we continue in our belief and hope for that which is true even in the very presence of that which not only fails to confirm our belief, but actually challenges it! Consider faith in the same light as courage. Does the lion tamer, who raised the deadly giant creature, require courage when putting his head in the mouth of the feline he raised from a cub? Perhaps it requires some, but what about the little old lady in the third row? She knows nothing of the animal, and its propensities. She has only heard its roar, seen its threatening teeth, and shrunk at the glistening muscles that drive it. Ask her to do the same as the lion tamer. Which of these two will show the most courage for the very same act? It is the one who faces the greatest fear! Even so it is with our faith. Those who know no doubt rely upon faith, but it is exercised most greatly by those who face doubt in large and threatening ways because they actually know less. For these, persistence in behavior – being “faith full” –draws upon their reservoir of trust in God much more so than those whose personality or experience delivers no such doubts. When I have seen people who were otherwise stalwart in faith shrink in the face of adversity. It is usually because they cling too tightly to some element of belief that itself is not some solid monolith as they might have supposed, but turns out to have shifting elements like sand. As they increase their grip on the granules, the shifting nature lets the grains slip one by one out of their hand until there is not enough for them to hold to. The actual topics of conversation in this regard could be myriad. It is almost always some teaching that is culturalized such that it becomes unofficially canonized in Mormon lore, or is perhaps something that was once taught and is no longer adhered to. We see this most markedly when the Church changes a policy or decision. Two large examples include the cessation of the practice of polygamy, and the lifting of the restriction of priesthood ordination of people from African ancestry. When polygamy stopped, some people clung to practices of prior years, and could not handle the shifting sands of practice. In the case of the priesthood ban, some could not let go of faulty teachings that sought to justify it, and they abandoned their faith because of it. People who cling so tightly to teachings and beliefs like this which can change are generally referred to as “fundamentalists”. These are people who cannot manage threats to their faith because of changes to what they had anchored themselves to. They leave no room for ongoing revelation, presuming that what was must always remain. Rather than reconsider their own thinking or assumptions, they conclude that the Church itself has moved away from truth and they find themselves rejecting it all! It is not because they lacked spiritual confirmations of gospel truths, or genuine communication with God. Rather, it is because the changes forced them to re-evaluate their thinking, and forced them to consider their faith all over again. Their assumptions – the grains of fundamental issues in their handful of beliefs – must be reconsidered. Because of one element that is now questioned, they must rethink it all (or so they suppose). In the end, they find themselves exchanging what they know for the doubts they now have forced upon them! The result is the proverbial baby swirling the drain with the bath wash.
Our friends and neighbors who seek the safety of the tent are those who look back on the naïve safety of what was really just a temporary shelter, believing they can regain the sense of security they once knew. These people have often had affirming experiences that touched them, and changed them. However, they generally failed to move on to house their faith in fundamental beliefs that has both a firm foundation and walls that cannot be shaken or penetrated. Unfortunately, some bells cannot be un-rung! 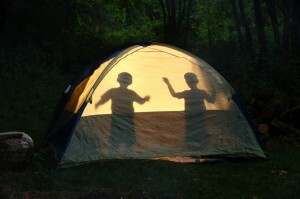 When the safety of their prior perceptions are called into question, all that can be done is to press forward and leave the seeming but deceptive safety of the tent and seek that shelter that comes from a more firm foundation. There are many topics that can shake our faith and threaten the security of what we “know”. I need not recount them here. The topics that shake one are not an issue for another. Some people are seemingly never shaken. For those who endure, however, there is a predictable pattern that others might do well to follow. Such who endure are those who are not fundamentalist, but who focus on fundamentals. These are not those who cling to elements of belief, but who get a grip on faith! The fundamental issues in the restored gospel are not expansive. They are really quite simple. I tend to think of them as the following: First, the priesthood of God has been restored through Joseph Smith, a prophet of God. Second, that very priesthood persists in the Church in the leadership of a First Presidency and Quorum of Twelve Apostles, men ordained with keys which control the covenant exercise of the ordinances that bind us and our Father in commitments and promises. Third, the Lord continues to govern His church through these leaders, and the process of revelation available to them is available to me individually so that like Nephi, I can know for myself what they know. Fourth, the Lord has revealed scriptures in addition to the Bible that can help me govern my spiritual life, including and especially the Book of Mormon. Fifth, Jesus Christ loves me such that he willingly suffered what I rightly deserve to suffer for my mistakes, but he freely gives to me the opportunity to let go of my guilt such that my confidence can be regained in the presence of God and I can return to Him as His child! These five fundamentals I can hold to. I have had spiritual confirmations that I can rely on that affirm the same to me. These issues I need not exchange for temporary questions that arise from Church history, political commentary, or changes in practice. Virtually everything else, I need not cling to. When it comes down to it, I need to base myself in these fundamentals, and avoid the fundamentalism that leads me to question the leaders who are so basic to the fundamental principle of ongoing revelation. If God does indeed provide ongoing revelation, and he teaches line upon line, precept upon precept, then it leads to reason that those in the past taught things that sometime in the future may not be believed. That is OK! We need not think that because God used one infallible prophet to guide us that the next infallible prophet cannot guide us even closer to what is right. Or, that the shifting needs of time and circumstances might not call for changing actions today compared to yesterday. When I do encounter that which threatens my belief, the healthiest thing for me to do is return not to the thin fabric of tent of some tangential experience, but reaffirm for myself the fundamental teachings I already “know”. I don’t need to cling to the shifting uncertainty of my assumptions, but to hold simply to the basic teachings foundational in the gospel. In this light I can persist, despite my doubts, across the chasm of uncertainty until I am able to reconcile what I know with what I don’t. I do this by recalling how merciful the Lord has been with me, and with all his Children. My journal, the scriptures, and the experiences of others can remind me of the affirmations I have already received on these fundamental issues. I do this by continuing to do what I know in my heart of hearts is right so that the Spirit,who can quickly withdraw when offended, is comfortable with me in His presence. I do this by keeping close to my Father in Heaven, expressing myself to him freely, and letting him express freely to me. And, I do this by letting go of my own assumptions, and letting God guide me in wisdoms paths. In so doing, I can find the strength to persist. As I venture out of the deceptive safety of my thinly veiled tent, I may need to re-evaluate some of my original assumptions. This can be challenging, but necessary. Do I associate my faith with that which is not fundamental? It doesn’t really matter if the ward I attended as a youth has the deacons line up on the side of the chapel, or in the front when passing the sacrament! It doesn’t matter whether Joseph translated the Book of Mormon using a seer stone in a hat or aUrim and Thummim set in spectacles. It doesn’t matter if polygamy started with Joseph or Brigham. What matters is that I know the fundamentals, and that I have a spiritual grounding in them. So a brief bit of advice. As you sojourn out in the online world where “anything goes” and truth and falsehood share equal billing, don’t be a fundamentalist, but focus on the fundamentals themselves. And don’t cling to your assumptions of belief so tightly that the Lord cannot guide you through the progressive world of ongoing revelation. Rather, get a grip on your faith! Focus on the simple truths you know by staying close to the Father that loves you. Then, as you learn more, you will have the patience with your faith to cross the chasms of uncertainty you are sure to encounter. After all, if God didn’t expect you to journey through life with doubts, he would be here himself telling you what to do. No, he give us doubts so that we might exercise faith, and when we do, we become strong enough to be useful to Him and His kingdom, and earn for ourselves a seat at His marriage feast. Would many of the 12 and 1st Presidency be included in these characterizations? Though we would like the story of polygamy to be this simple, this black and white, we have the uncomfortable truth that Church leadership continued to practice and authorize plural marriage past 1890, including the Presidents of the Church. Some apostles believed the manifesto was red herring. You might even conclude Joseph F. Smith believed this at first given his continued and amazing authorization of post-manifesto polygamy. … then you can get an idea of why some fundamentalists have the position they do. I do not endorse or associate with any fundamentalists, but I don’t think the issue is so black and white as we would want it to be. Be curious to hear other people’s thoughts. Thank you.